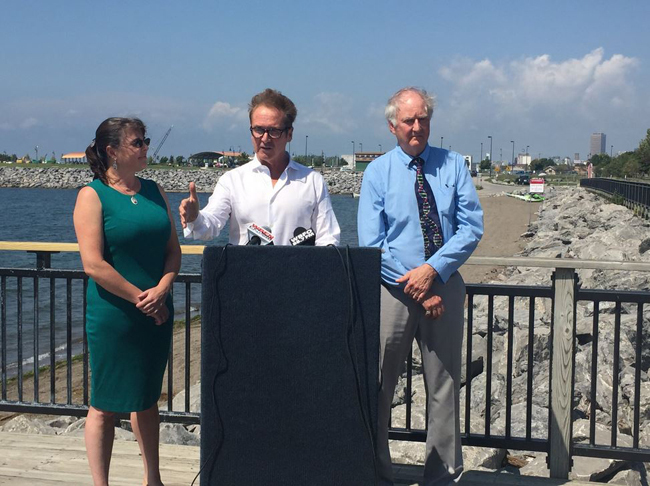 Buffalo, NY, August 26, 2016 - Congressman Brian Higgins (NY-26) was joined by researchers from the Buffalo State Great Lakes Center to announce funding from New York Sea Grant to support an innovative study intended to identify the source impacting water quality in the area around Gallagher Pier on Buffalo’s Outer Harbor. Along Buffalo’s Outer Harbor sits Gallagher Pier and beach-area, a 1400 foot long Lake Erie shoreline property included within Buffalo Harbor State Park. The spot is frequented by wind surfers, kayakers and sun bathers but is currently restricted from use as a swimming beach due to bacteria levels. The Great Lakes Center, an institute of SUNY Buffalo State researchers and educators dedicated to investigating the ecology of the Great Lakes and their tributaries, was awarded an $11,911 New York Sea Grant for the Gallagher Pier water study. Buffalo State Biology Department faculty members Gary Pettibone, professor, and Amy McMillan, associate professor, will collaborate with the Great Lakes Center as principal investigators on the project. Great Lakes Center researchers will use recently developed culture-independent molecular analyses to compare the genetic signatures of bacteria from selected samples of water near Gallagher Pier to potential point-sources for pollution. The two sites under investigation are a storm drain located 600 feet south of Gallagher Beach and a Ring-Billed Gull nesting colony site 3,800 feet southwest of the Beach. Through Next Generation Sequencing researchers will compare and match the gene sequences to identify the source leading to bacterial contamination at Gallagher Pier. 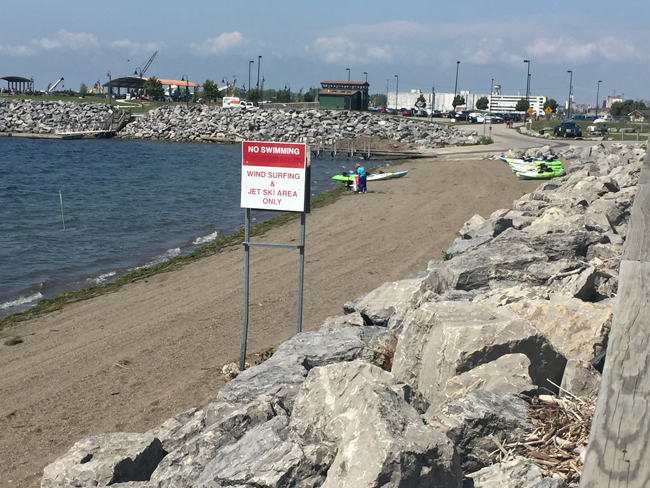 Identification of the source will allow for future corrective action at a targeted site toward the goal of reducing bacteria and making Gallagher Beach swimmable. New York Sea Grant Director William Wise said, "Coastal cities across the Country are aggressively expanding water-based recreational opportunities for their citizens. 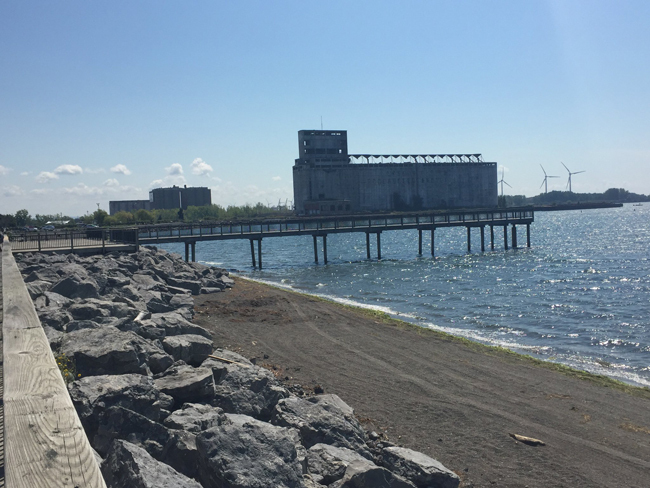 New York Sea Grant is pleased to support this important research by scientists from Buffalo State to determine the source of water quality impairment in the Park's Gallagher Pier area. Documenting this source is a necessary first step in any effort to abate the impairment and make these waters safe and swimmable, for Buffalonians to fully enjoy." Congressman Higgins has long advocated for a sand and swimming beach at Gallagher Beach. 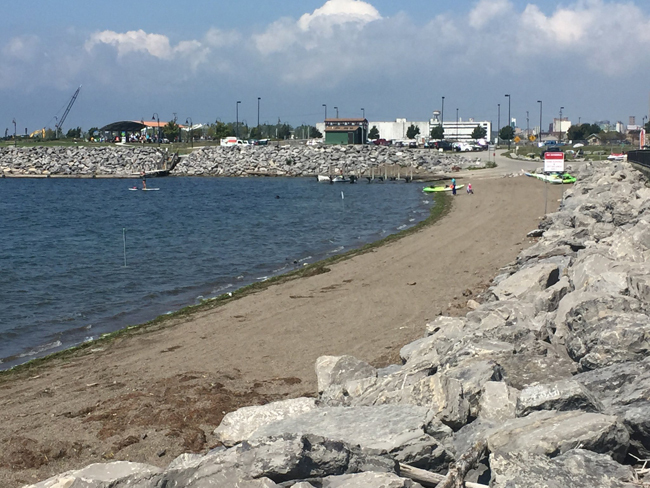 The site became the first waterfront development project in Western New York when in 2003, then-Assemblyman Brian Higgins, pushed for and won the start of a $4 million boardwalk and improvement project along Gallagher Beach. In recent years an additional $1.4 million in federal funding supported the creation of a pavilion and picnic area as well as improvements to the boardwalk at Gallagher Pier. "There is great public demand for swimming at Gallagher Beach. This new study funded by New York Sea Grant is first step to solving water quality issue," said Congressman Brian Higgins at the press conference. "With research we hope to isolate the problem and eventually give the public the full-functioning beach they are drawn to," said Congressman Brian Higgins at the press conference. 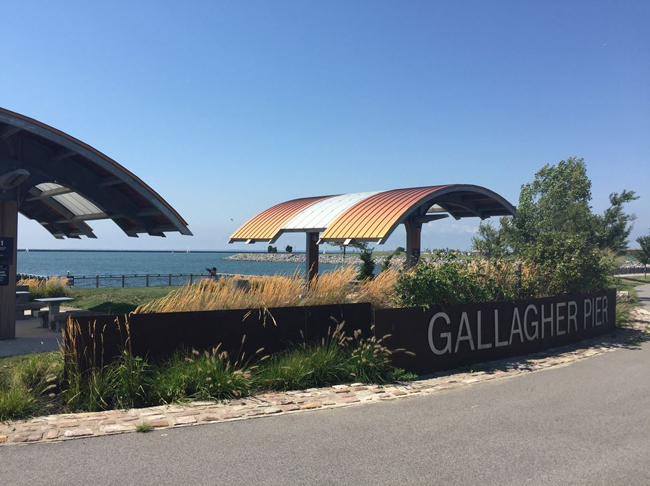 "Gallagher Beach was Western New York’s first waterfront project and we do not need to accept that it is non-swimmable long-term," said Congressman Brian Higgins at the press conference.